"This classic side gets upgraded with the wonderful addition of Tuscan flavor infused broth. It's so easy to prepare and you can have this delicious dish ready in just 35 minutes. This is a fabulous complement to your main dish." Heat the oil in a 4-quart saucepan over medium heat. Add the onion and cook for 3 minutes, stirring occasionally. Stir the rice in the saucepan. Add 1/2 cup broth and cook and stir until it's absorbed. Add the remaining broth, 1/2 cup at a time, stirring until the broth is absorbed before adding more. Stir in the cheese before serving. 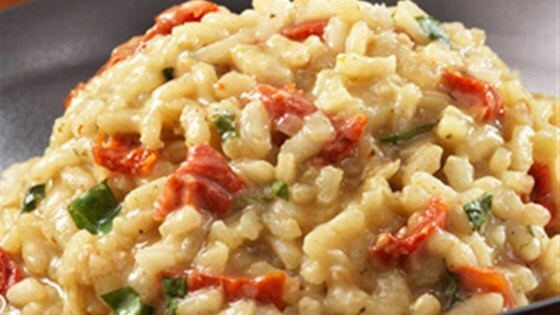 A bright fall inspired risotto made with Swanson® Unsalted Chicken Stock. Flavor Variation: Stir in 1/3 cup chopped sun-dried tomatoes and 2 tablespoons chopped fresh basil leaves before serving. This turned out amazing and everyone really loved it. Recipe was simple, easy to follow, and I will definitely be making it again. A Keeper for sure! This was my first attempt at making risotto and it turned out great! It is good starting recipe and my family is excited to have it again and experiment with added ingredients.